Coroware/Satarchy Robotics produces standardized and custom robot solutions for Unversitey, technical colleges, government, municipalities and laboratories. Using open platform concepts you can choose your mobile base, sensors and electronics, and your choice of robot operating systems: 'Linux' or 'Windows 7 Embedded' or both. 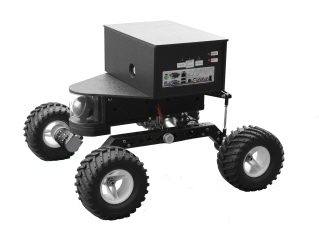 CoroBot is a capable, expandable and affordable mobile robot platform designed to minimize the complexity of robot development. The unit comes fully assembled and tested with your choice of operating systems pre-installed. Because CoroBot is assembled with real hardware, as opposed to plastic clips, it is fully modifiable and expandable. Equipped with a PC-class CPU, CoroBot features expansive program storage space and CPU capacity to run additional software. CoroBot�s design assists the hardware developer with additional physical mounting space, communication, and electrical inputs and outputs. Designed from the ground up with you in mind, CoroBot is a capable, expandable, and affordable way to meet your specific needs and requirements. 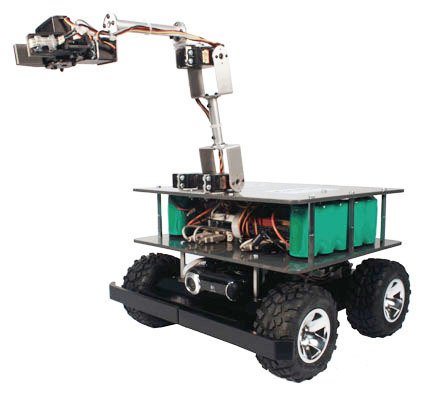 Explorer was created to expand on the capabilities of the CoroBot and deliver a rugged indoor/outdoor robot that can withstand environmental elements such as dirt, dust, leaf debris, sand, gravel and shallow puddles. 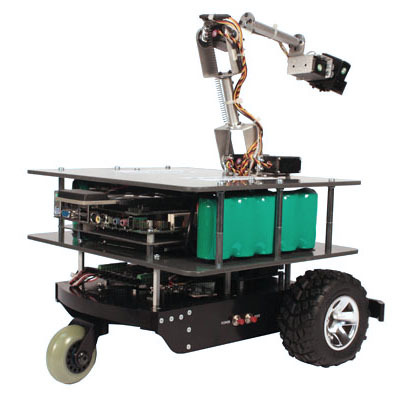 Extra ports and surface mounting space make Explorer a robust and expandable research robot. Equipped with a PC-class CPU, Explorer features expansive program storage space and CPU capacity to run additional software. Explorer�s design assists the hardware developer with additional physical mounting space, communication, and electrical inputs and outputs. Designed from the ground up with you in mind, Explorer is a capable, expandable, andaffordable way to meet your specific needs and requirements. The Explorer can be purchased running Windows, Linux, or in a dual-boot configuration. The Windows� version comes with a C-language API (Application Programming Interface), while the Linux� version comes with Player, allowing teleoperation right out of the box. Drivers and applications are provided in both source and executable form allowing for immediate usage as well as modifications and enhancements by the owner. Explorer's camera, wheel encoders, optional laser ranger finder and bumper sensors enable your robot to examine the environment. Want to add autonomy? Explorer�s processer has the room to handle localization and mapping algorithms, path planning, vision processing, learning algorithms and more. Rather than being limited by flash memory space Explorer provides ample disk space to store maps, log files, learning databases and more.